Mums today have all the mod cons they could want at the tips of their fingers. Inventions that help make life easier, save time and entertain little ones when they really need a breather. We’re also not in the middle of a World War or have a black plague to contend with like generations before us, so why do many believe it’s harder to raise kids now than ever before? Here are six possible reasons you’re feeling the pinch. Working mothers with deadlines, commutes and external responsibilities (as opposed to helping milk the dairy cows on the farm) are very much the norm now compared to earlier decades. More women with children today also have full-time jobs (compared to part-time), yet on average we’re still spending more time on housework and parenting duties than men. So while we may not be washing a zillion poo stained cloths down by the river or churning our own butter; we’re pretty darn busy when you also factor in things like work, travel time, daycare pick ups, cooking and cleaning. It leaves little time for parenting which then leads to increased stress and the dreaded mum guilt. In previous generations most people married for life. Divorce and separation from partners were nowhere near as common as they are now, so generally speaking there was less family conflict, logistical hassles, financial issues and more security and stability for children. There are also a lot of women doing motherhood alone now (whether by choice or not), which again can add a lot of additional pressure emotionally and financially compared to parents who are together. 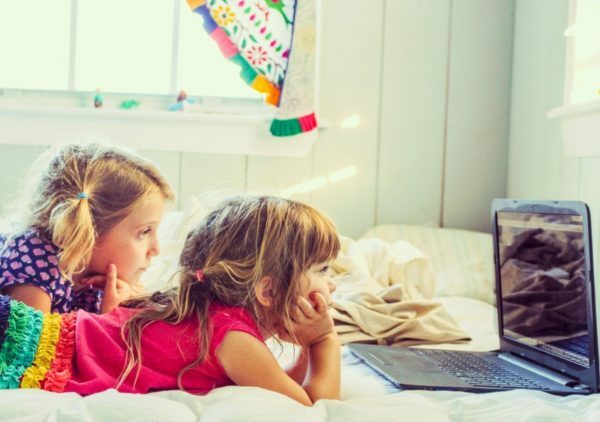 Ah screens, a blessing and a curse.When it comes to children they can be a godsend for when busy modern mums need to get something done, and yet they can also create increased rage, behavioural issues and be the source of constant battles for parents. Things like mobiles are handy yet who knows exactly how much they’re contributing to young children becoming more upset and clingy as they watch their mother’s attention being taken away from them so openly. More technology and gadgets in the house also means there are more things that can break and then need to get fixed, and the recent surge in addictive television shows (c’mon, who wants to miss Game of Thrones?!) can result in many already sleep deprived mums staying up waaaay too late and then struggling the next day. Facebook and Instagram can be great for stay-at-home mums who might be feeling isolated or those looking for quick parenting advice or support, but they can also be a source of anguish for many. There are a lot of unrealistic images of parenthood being portrayed online these days, putting the pressure on mothers to post photos of incredible homemade birthday cakes, slim post-baby bodies and amazing family vacations (the comments and likes for which they then end up obsessing over). This very public display of perfection can isolate rather than connect, creating a lot of anxiety and self-doubt in struggling mums. We also have to contend with narrow-minded judgement of strangers on a whole variety of issues, including breastfeeding in public at the local cafe or how you handle a toddler tantrum in the supermarket. Parenting in the old days was mostly done behind closed doors (which also had its own set of pros and cons) and a mummy win was when your child survived into adulthood. Okay, so there’s a lot of awareness now on healthy eating – particularly for children. The recent clean and wholefood movement, and increasing education around obesity and diabetes has thankfully meant we’re now not so ready to give kids Coca-Cola for breakfast. However… are there more drive-through fast-food restaurants, cafe playdates, over-the-top children’s parties, than ever before? Yeah, you betcha. You can even order your family’s favourite calorie-laden meal on Uber Eats or the like, and it will come straight to your door. All of our modern gadgets and conveniences should mean we have a lot more time on our hands, but this isn’t the case. Mums are now busier than ever, even if they don’t work, because apparently we actually spend more time with our children (even if we’re more distracted) than earlier generations. For example, we used to let our kids play for hours unsupervised in the garden or on the kitchen floor while we cooked and were happy to let them roam the streets at five years old. But now it’s a closely monitored, tight and stressful schedule of playdates, swimming lessons, OT, book week costume making and numerous doctor visits which is hard for both mums and kids. So DO mums now really have it worse? The jury is still out, and individual circumstances vary dramatically of course, but one thing’s for sure – being a mother today can be pretty darn hard. Luckily, it’s also totally worth it. Remind yourself daily of what an awesome job you’re doing. Hang in there mums – you’ve got this! Do you think mums today are doing it harder than previous generations?